Hurray! We are ready to share the news with you! 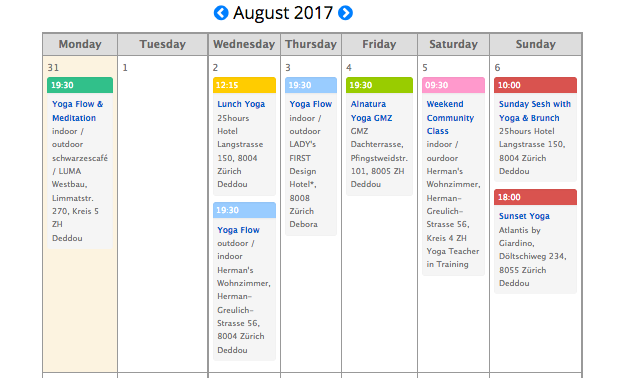 As our weekly schedule grows and you have more opportunities to practice exhilarating yoga in exciting places with us, so too does our effort behind the scenes to organise everything. But we made it and found a way to offer you more classes and at the same time make it easier for you to manage your bookings and having an overview of the classes & workshops you are planning to attend. We are ready to share the news with you. At the same time we are adding 2 community classes to our weekly schedule for only 15fr/class. In these Community Classes you experience creative flows by our Yoga Teachers in Training who will be sharing their passion with you. Uplifting music, dynamic flows in true POP UP YOGA style and changing teachers in training for every Community Class. 4) Easy to cancel booking: In the booking confirmation you find a link to click to cancel the class. It is possible to cancel a class upto 2 hours prior to the class start. Please make sure you cancel the class in time, otherwise the system will charge you for the class. You can still choose to pay in cash as you come to class. However, you can also purchase your class pass online with a credit card. In only a few clicks, you get a new pass that will be linked to your account. Bonus: From now on you receive an automatic online receipt and we will let you know once your class pass is almost used up. We are excited to continue on this yoga journey with you, unroll our mats in exhiting locations and flow though exhilarating yoga flow classes together.